Accurate retrievals of liquid water path (LWP) from passive microwave radiometers rely on the use of radiative transfer models to describe the absorption of radiation by various atmospheric components. When clouds are present, atmospheric absorption is affected by the dielectric properties of liquid water. The purpose of the study is to compare measurements of microwave absorption with model computations in supercooled liquid clouds that have temperatures between 0°C and -30°C. Models of liquid water permittivity in this temperature range suffer from a lack of laboratory measurements and are generally derived from the extrapolation of available data. In this work, we use observations collected at five frequencies between 23.8 and 170 GHz to assess four models of the complex permittivity of water. An additional rationale for this work is to examine to what degree the use of different dielectric models affects the retrieval of LWP in supercooled liquid clouds. Inaccuracies in modeling the water permittivity at low temperatures are likely one of the largest sources of retrieval uncertainty in supercooled clouds, uncertainty that could offset the advantages offered by the enhanced sensitivity of channels at frequencies at and above 90 GHz relative to lower frequencies. The four radiometers used in this study are part of the U.S. Department of Energy (DOE) Atmospheric Radiation Measurement (ARM) Climate Research Facility. 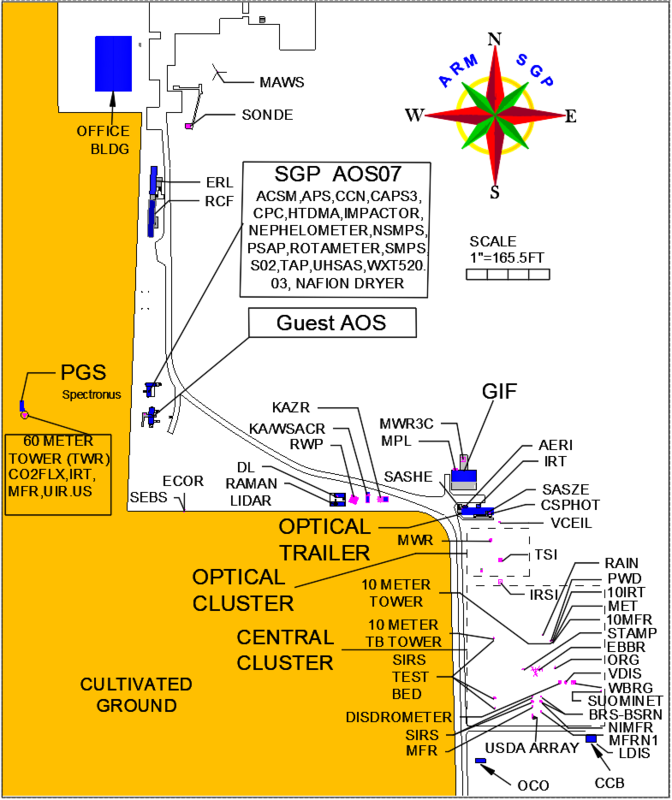 Two of the radiometers are located at the Southern Great Plains (SGP) site in Oklahoma and include a two-channel microwave radiometer (MWR) operating at 23.8 and 31.4 GHz and a microwave radiometer high-frequency (MWRHF) operating at 90 and 150 GHz. The two remaining radiometers are located at the North Slope of Alaska (NSA). One is an MWR similar to that in Oklahoma, and the second is a G-band vapor radiometer profiler (GVRP), a millimeter-wave radiometer with 15 channels between 170 and 183.31 GHz. Several periods of single-layer supercooled liquid clouds were examined at the SGP during a four-month period from November 2008 to February 2009. At the NSA two periods were identified during March 2007. Near-coincident data from a Vaisala ceilometer, radiosondes, and an atmospheric emitted radiance interferometer were analyzed in addition to the measurements from the microwave radiometers. Independent retrievals of LWP are necessary to compare the observed sky brightness temperatures from the various microwave radiometers with simulations in cloudy conditions. For this reason LWP was independently retrieved with the mixed-phase cloud property retrieval algorithm (MIXCRA) when the LWP was less than 60 g/m2. Path-averaged mass absorption coefficients were computed at all frequencies and compared with model computations. The results are shown in Figure 1, where four dielectric models are compared to the observations. The results show that at cold temperatures and at frequencies above 90 GHz, there are substantial discrepancies between models and observations when the cloud temperature is below ~ -10°C. These discrepancies would lead to an underestimation of supercooled LWP if high frequencies were used in the retrieval algorithm. The study was able to identify which model (among those examined) produces results that are closer to the observations, at the same time evidencing the need for additional measurements of dielectric properties of liquid water in supercooled state. Estimated and calculated mass absorption coefficients for the five frequencies used in this study: 23.8, 31.4, 90.0, 150.0, and 170.0 GHz (top to bottom, respectively). Points with error bars (±1 standard deviation) are estimated from brightness temperature measurements. The models are (circles) Liebe-91, (crosses) Liebe-93, (squares) Ellison-06, and (stars) Stogryn-95.